For the novice runner to seasoned athlete. Progressive sessions focus on biomechanics, endurance, speed, injury prevention, best gear to maximize performance and more. Space is limited to allow specialized attention to each attendee – any available slots fill fast. Register early to reserve your space. If available slots are full and/or don’t accommodate your busy schedule, contact us about putting together your own small group training program. Each program session length: 70 minutes. Focused on the novice runner, Running 101 is ideal for a new runner or athlete returning to the sport after a layoff or injury. Runners comfortable with running for at least 30-60 seconds without a break will be comfortable in Running 101. This program is a good bridge from walking to running. While Running 101 is open to all fitness levels, we encourage runners capable of running a mile in 9:00 or faster, and/or those able to run five miles or more without stopping to consider Running 201. The Running 101 program helps you gradually increase your running volume, while focusing on proper running technique and a strong fundamental base. By the end of the program, you will be prepared to cross the finish line for a race of 5k to 10k distance. This program is designed to enhance your overall running experience and progress while gaining professional coaching advice. Note: Repeat Running 101 and 201 attendees receive $10.00 off their 2nd or subsequent Running Program – contact us for details. Pre-requisite: Must be injury-free and have a desire to learn to run biomechanics and technique. Training workouts provided between sessions. Running 201 is offered as a follow-up to Running 101, though you need not have participated in a Running 101 program to register. Runner 201 is designed for a runner with an existing run volume base seeking to improve his/her performance at the 5k, 10k and/or half-marathon race distances and/or build the endurance and skills to move to a longer event. If you can run a 9:00 mile or faster, or you can run 5 miles at a slower pace without stopping, the Running 201 program is for you. Current participants have run 5k race distance or longer events with minimal to no walking. This program is designed to enhance your overall running performance and progress while gaining professional coaching advice. Note: Repeat Running 101 or 201 attendees receive $10.00 off their 2nd or subsequent Running Program – contact us for details. Pre-requisite: Must be injury-free and should be training regularly (running approx. 3 to 5 times per week and able to run continuously for at least 45 min. to over 1 hour+). 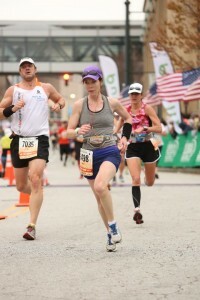 This is an 20-week training program that prepares participants for a 26.2 mile marathon race. Optional Saturday morning runs are grouped by pace levels. Participants receive a training schedule with suggested daily & weekly workouts, technical shirt, official participating store discounts, fun, encouragement and camaraderie! Support for long distance runs. Train for your next marathon with us! Pre-requisite: Must be injury-free and should be running consistently approx. 3 to 4 times per week for a minimum of 6 miles without stopping before starting this program. Strength training for endurance sports has unique challenges. The athlete needs to maximize strength without risking overtraining. This is possible through Functional Strength Training (FST). Functional Strength Training (FST) is a method of training that is very specific to the demands of the athletic activity. This training can include free weights, cable machines, elastic bands or tubing, stability balls, medicine balls and balance boards. Functional strength training exercises are sport-specific, require stabilization, can be explosive/ power based and have an acceleration/ deceleration component. It is important to train movements, not muscles. The exercise movements should closely resemble those of endurance sports (i.e. triathlon, duathlon, cycling, and running). Research has revealed that beginning about the early thirties, athletes will lose approximately .0.5lbs of lean muscle per year if they do not engage in strength training. Strictly Strength is a multi-level class for anyone who wants to develop muscular strength. Each session covers basic resistance training exercises using traditional and alternative principles in a safe and supportive environment. We challenge every muscle group using a variety of equipment as well as incorporating balance and coordination by moving through all planes of motion with multi-joint and compound exercises. Training methods include a combination of free weights, cable machines, elastic bands or tubing, stability balls, medicine balls and balance boards.